Healthcare.gov is still not handling the load? : Is There A Problem Here? 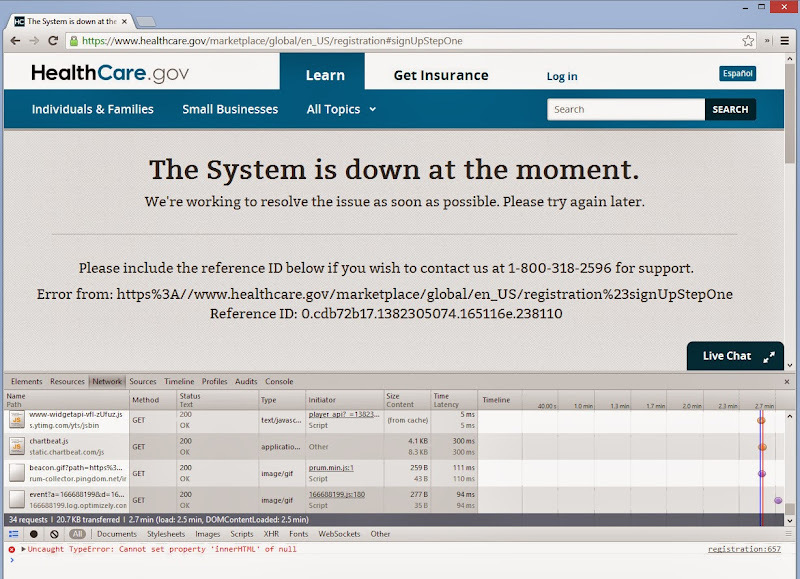 : Healthcare.gov is still not handling the load? Healthcare.gov is still not handling the load? Nearly three weeks after launching the online Insurance Marketplace, Healthcare.gov appears to still not be able to handle the load. One moment it works, the next it fails to load. And when it fails, it has been freezing up my browser or taking many minutes to return an error page. Other times, it returns a blank page rather than an error page. Three weeks may be a short time in government software development, but it is a very long time in Internet time. If you call support, I wish you a good connection as you try to read that 36-character reference ID over the phone. Any advice for me? I've been able to create an account and got an e-mail telling me my eligibility results were ready and that I must read them before I enroll. I'm able to log in and see my account and completed application, however, every time I try to "View Eligibility Results" it goes to a blank page. It's been this way for 2 weeks. I have been attempting to use the chat function. So far I have found the person on the onther end has no online access to your data, so they can't look you up/etc. AND their pre-written greetings etc take up over 50% of the allowable text--three times this morning I got to the point where they were going to escalate my issue to the Problem Resolution Center, but then could not enter contact info etc due to lack of space. Same thing for me Pam. I hope they fix it soon. Same 4 Me. Hope this fix it soon!